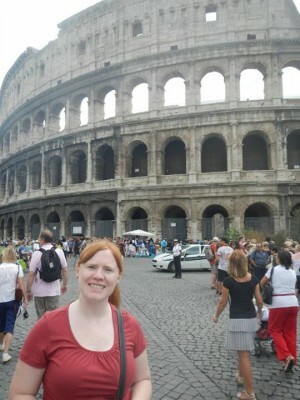 Jillian Warren – Communication | Marketing | Writing | Web | Media | Raleigh & Durham, NC – Studio Italiano! I’ve thought about taking an Italian class for a while now, and this winter, I finally did! As a former French major, I’ve always loved learning a second language, and I already had a solid foundation in romance languages. Unfortunately, my level of French is too high for most continuing education courses and not high enough to fit in with fluent speakers, so I’d had to put my formal foreign language education on hold since graduation. Then, my thoughts began to drift toward Italian. My visit to Il Colosseo in September 2012. Why Italian? As a language, Italian is similar to French, and it is attached to a beautiful culture and country. It’s also the language of music, so I’d already inadvertently studied Italian vocabulary in piano and clarinet lessons. And, we all know Italian food! Then, when my husband (an Italian history buff) and I decided to visit Florence and Rome a couple years ago, I bought some Italian CDs to teach myself the basics. Although I hardly used my new-found language skills while we were over there, after our trip, I was hooked. So much so that we seriously considered a second trip to Italy this spring (but sadly plans have since changed). 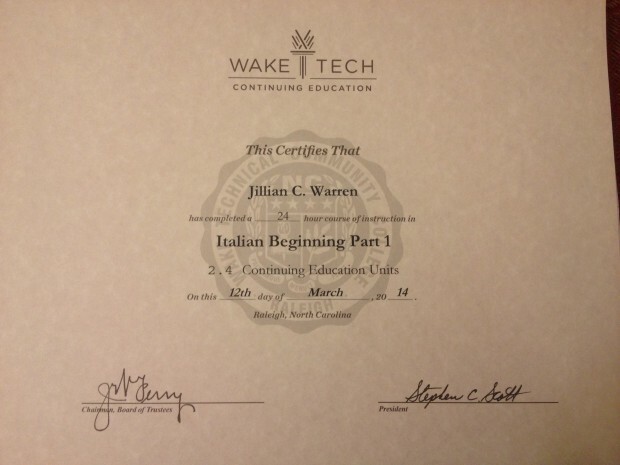 When I saw that Wake Tech was offering a Beginning Italian 1 continuing education course that fit my schedule, I jumped at the chance! At first, I was nervous about being back in a classroom again after many years away, especially for three straight hours each week. However, once that first class session started, I knew I was back in my element. Fortunately, I had a terrific professoressa, and the other students were all in the same boat as me. The course moved at a very quick pace, but we started with the rules of grammar and pronunciation, and then built on it with practical vocabulary. I would highly recommend it! Next up: Beginning Italian 2. The new semester starts today, and sono pronto!